Winter magic on the Plitvice Lakes - Explore Croatia Become a Patron! The Plitvice Lakes is Croatia’s most famous national park. Breath-taking waterfalls, tranquil lakes, impressive canyons, a lush and wild forest… all this attracts over a million visitors each year. 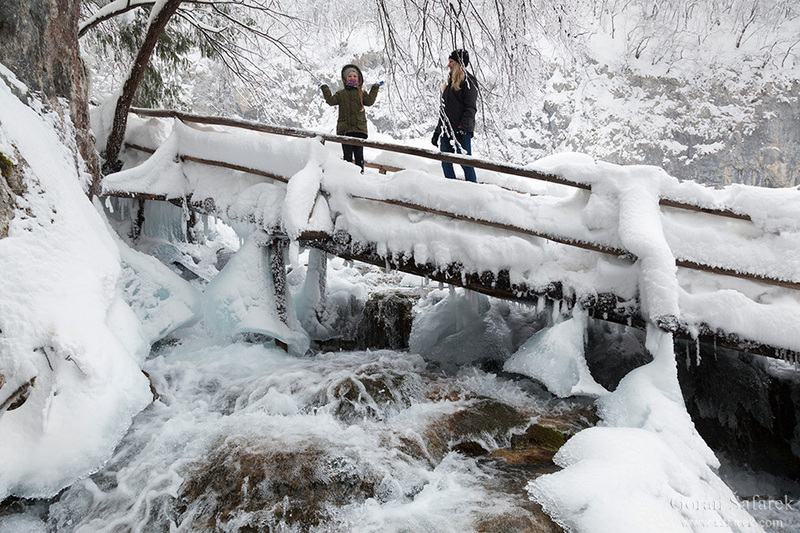 On the Plitvice Lakes every season is stunning and special, but in winter, its frozen waterfalls, snow-covered tracks, trees trapped in ice and frost make the lakes look like a winter magic story set, the seat of the Snow Queen herself. The Plitvice Lakes are Croatia’s most famous national park. We’ve all seen picture postcard views of the lakes: murmuring and magnificent waterfalls, smaller and larger blue lakes reflecting the surrounding lush vegetation, and the karst of the canyons. The lakes’ cold but crystal clear waters allow visitors to admire the fish, crabs and other residents of the lakes. Over a million people a year from all corners of the world tread the miles of the surrounding tracks, particularly the wooden footbridges that reach the heart of this natural jewel. They were right to come here, and so was UNESCO when it included this park in its list of world heritage sites. Except for beauty, this park has been protecting and preserving another great natural value, first and foremost tuff, a magic substance that had built this world wonder. Tuff is a type of rock which is formed by waterfalls and which, in a continuous cycle, forms waterfalls. See our Guide to the Plitvice Lakes. Plitvice Lakes are on our list of the TOP 10 nature. See also the Guide to Croatian national and nature parks. The Plitvice Lakes are beautiful during all seasons. In spring, everything turns green, and the waterfalls, fed by rains, are in full swing. In summer, they quiet down, and the lakes then radiate a certain calmness and dignity. Rains return in autumn, and in October the lakes are draped in a stunning yellow and red coat. 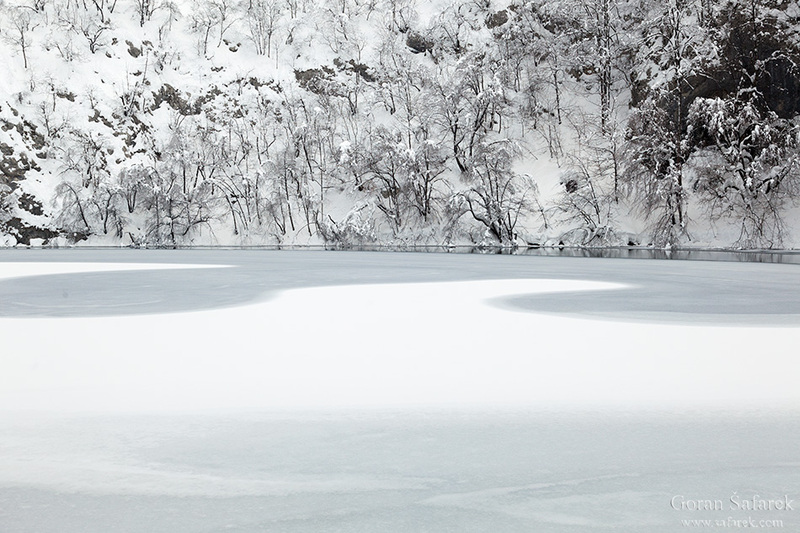 The Plitvice Lakes do not lose their charm in winter either. 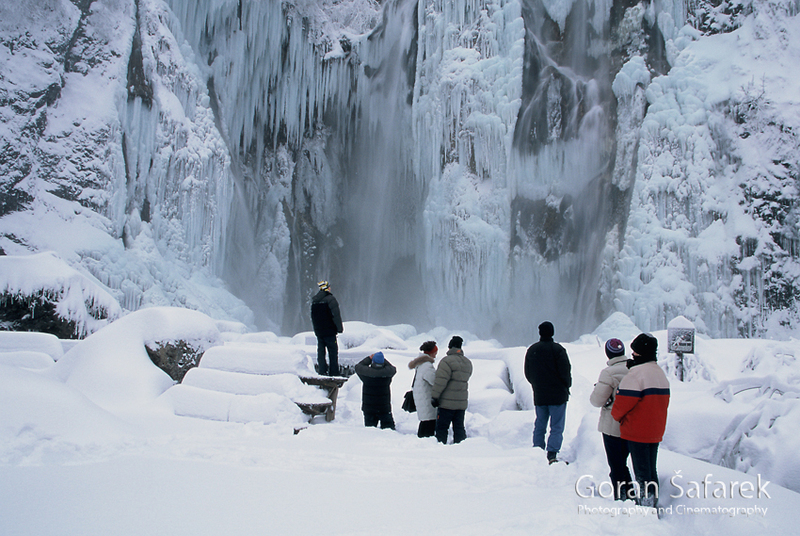 Moreover, the frozen lakes and waterfalls make them look particularly attractive. But, for the impression to be as beautiful as possible, a very cold winter should go hand in hand with lots of snow. This isn’t so every year, but when it is, the lakes become a real winter magic fairy tale set. However, unlike the Snow Queen fairy tale, everything is tame and idyllic here. Lika is the coldest region in Croatia, and the name of one of the peaks, Ozeblin (Frostbitten in translation), speaks volumes about the temperatures ruling the region. 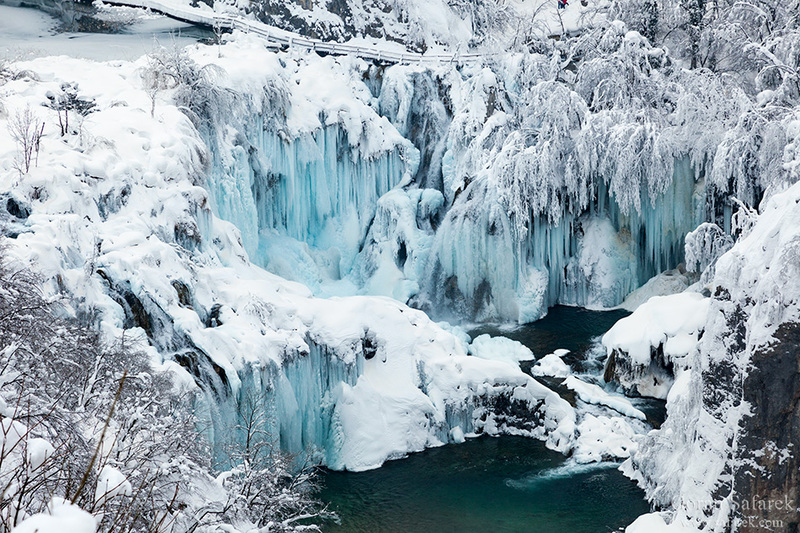 The ice-cold breath of winter freezes even the biggest and most powerful waterfalls of Plitvice. The most beautiful view of the national park stretches from the lookout point at Entrance 1. The 78-metre-tall Great Waterfall, also called the Plitvice Waterfall, which a water curtain falls from, and whose droplets refresh and moisten from afar, is now kept a firm grip on by winter. Only a tiny stream of water hints at its now fully tamed power. 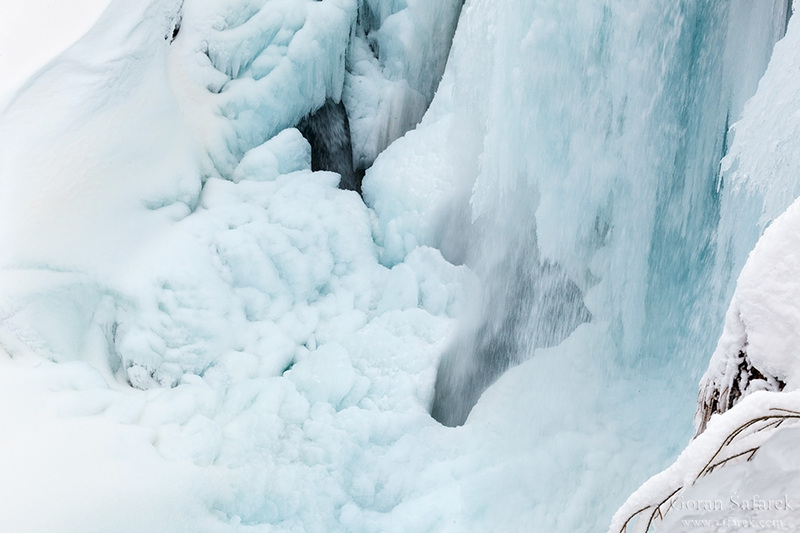 Enormously long icicles, waterfall crests during the other seasons, hang from rocky cliffs, and it seems as if they could break off at any time, but they are firmly attached. Nevertheless, erring on the side of caution is recommended because nature is indeed unpredictable. Sastavci too, the spot where this waterfall crashes and connects with the last lake, is now an ice crater, and its tiny stream of water appears to be playing in the light in an almost surreal shade of turquoise. 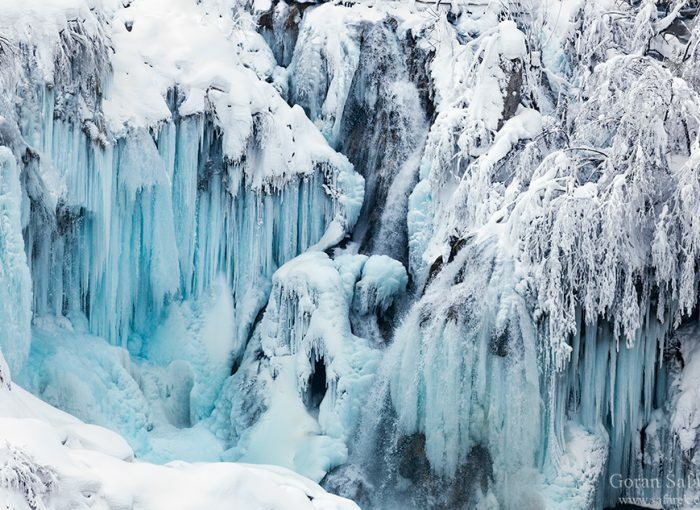 The shapes of ice of frozen waterfalls created by cold winter days are difficult to describe by even the most vivid of imaginations. Ice glitters in the clear sky, which is as blue as the sea, and there’s no humidity. The distant mountain peaks, which are normally veiled in a greyish mist and high humidity, now sparkle in the sun. But, it’s from the snow cover on the lakes that the eyes suffer the most. 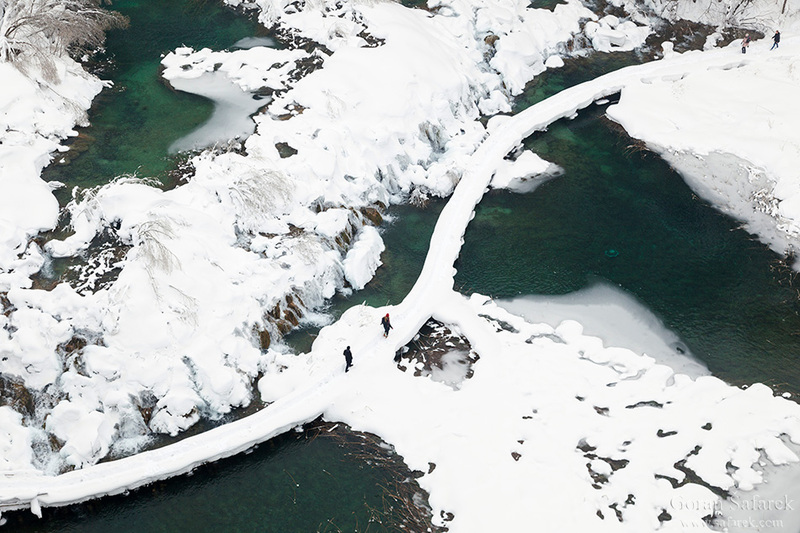 The lakeshores are now almost unrecognisable, the sharp contours of rocks and the plants are now snow-covered curves. However, this beauty can easily mislead – one wrong step and you’ll find yourself on ice. During the toughest of winters, the thickness of the ice would hold your weight, but this should not be tested at any cost. Not only for safety reasons, but also because of the strict nature protection rules of the national park. Walking outside tracks that have been cleaned is virtually impossible since the snow cover can easily reach over a metre in height. Due to extreme weather conditions, only a small part of the park is open in winter, the part around the canyon. These are the Lower Lakes, the last ones in a cascading sequence. In the rest of the national park, nature, peace and quiet reign now. This time of the year gives the lynx, the wolf and the bear the chance to reclaim the lost territory of the Upper Lakes, which once belonged to them before man decided to settle there. But once the snow melts and people again head to the Upper Lakes, these magnificent animals will once again return to the deep forests surrounding the national park. The area of the Plitvice Lakes provides a sufficiently large habitat for these big beasts that have become extinct in much of Europe. Winter in the Plitvice Lakes can indeed be long, giving all nature lovers a chance to visit this frozen piece of paradise on earth. And this is a chance that must not be missed out on.